Monday offered a rare, summer-like November Monday with no school for the kids and no work for the hubby… a bonus one-day vacation! Even more rare, my husband applied my research techniques to find something wonderful for the whole family, even the dog! His discovery: The Dunn Erwin Rail Trail. The Dunn Erwin Rail Trail is a five mile fine gravel trail connecting the towns of Dunn and Erwin, North Carolina. The trail is built on the old Aberdeen & Rockfish rail line that ran coal from Dunn to Erwin for the Swift Denim Mills Power Plant. The power plant switched to truck delivered oil in 1998, making that section of railroad unnecessary. 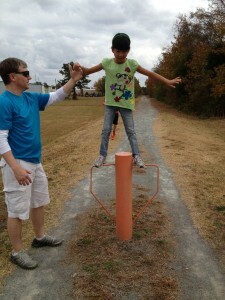 Ellie stands tall on the posts that protect the trail from motorized vehicles. Not to be outdone, Ben catches the ball as he jumps from the post. 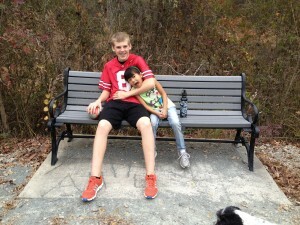 Benches along the route offer a place to rest — or ham it up! Revitalized by the company, the trail offers an easy trail for walkers, runners, bicyclists and even baby strollers. Dogs are permitted on the trail on leashes, but it is not open to horses or motorized vehicles. Fairly flat, the trail is easy to walk. We covered more than 2 miles (one way) with our 15 year old, 8 year old and small dog. The Dunn Erwin Rail Trail wanders through cotton fields, behind neighborhoods and past small factories. While it crosses many rural roadways, the trail is well marked and quite safe. 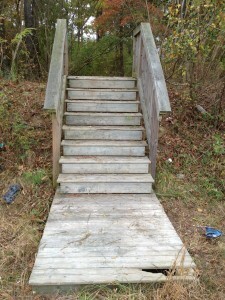 Near Dunn, we discovered the staircase to “nowhere” and had to explore! 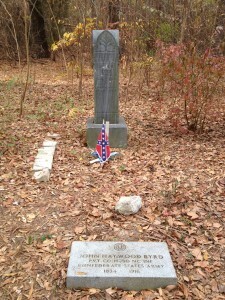 At the end of the stairs to “nowhere,” we found the grave of John Haywood Byrd, a Confederate soldier who survived the Civil War. 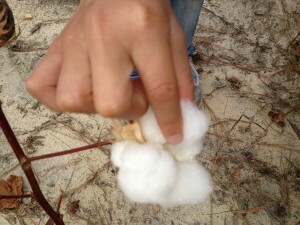 Ellie had no idea that cotton grew on plants (around our house, farmers grow tobacco and sweet potatoes). She got to feel the seed inside the puff of cotton and learn about Eli Whitney who invented the cotton gin. To make a full day of it, we highly recommend starting with a morning “snack” from Sherry’s Bakery in Dunn. Our son declares the lemon filled doughnut “perfect,” lemony, but not too tart and not too sweet. Walk to Erwin, just remember your water bottle, enjoy lunch at Tubby’s Diner and then walk back to Dunn. Okay… maybe ten miles is a bit far for most people. It sure would be easy to bike it, though. 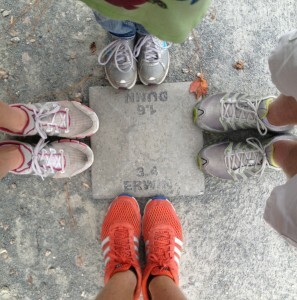 We thoroughly enjoyed our long stroll along the Dunn Erwin Rail Trail and plan to return again soon. Next time, we will pack more snacks and start earlier in the day so we can walk the full trail. While researching this dog friendly trail, my husband found several other historic rail trails near our house. We are definitely adding these budget friendly one day vacations to our family list of things to do in North Carolina! Come visit anytime. I’ll have the sweet tea and good old fashioned southern porch swing ready and waiting! This kind of family time is the best, isn’t it?? I think these memories are the ones that stick around the most, and they’re fun! Never heard of it, but what a neat find! 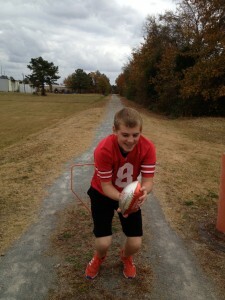 so cool going on a rail trail. Would like to bring the kids on one too if I get the chance. They have them throughout the United States. A dear friend of mine bikes one near her home in Ohio often. So relaxing. I’ve never heard of this place, but it seems like you all had a wonderful time. Nichole, are you in North Carolina? There are several throughout the state — and I intend to travel each and every one!